Why it's a winner: You can walk anywhere, anytime. Use a treadmill or hit the streets. How to: Whether you walk, run, dance, or do another cardio exercise, push up the pace for a minute or two. Then back off for 2 to 4 minutes. 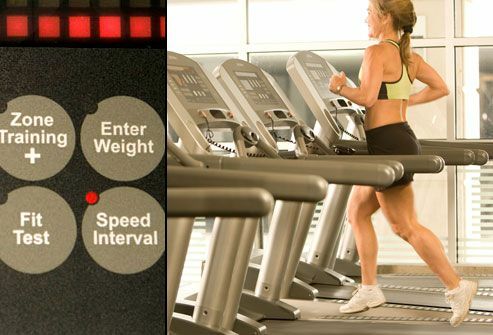 How long your interval should last depends on the length of your workout and how much recovery time you need. A trainer can fine-tune the pacing. 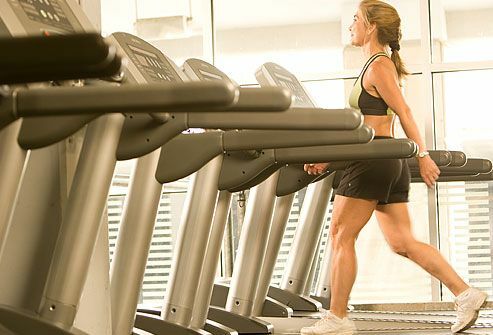 Repeat the intervals throughout your workout. How to: Keep your feet shoulder-width apart and your back straight. Bend your knees and lower your rear as if you were sitting down in a chair. Your weight should be evenly distributed on 3 points of your feet -- heel, outaside ball, inside ball -- that form a triangle. Your knees won't stay in line with your ankles that way, but there will be less strain on other parts of your body. Add dumbbells once you can do 12 reps with good form. Start by lying on your back with your feet flat on the floor and your head resting in the palm of one hand and the other hand reaching toward your knees. Press your lower back down. Contract your abdominal muscles (abs) and in one smooth move, raise your head, then your neck, shoulders, and upper back off the floor. Tuck in your chin slightly. Lower back down and repeat.